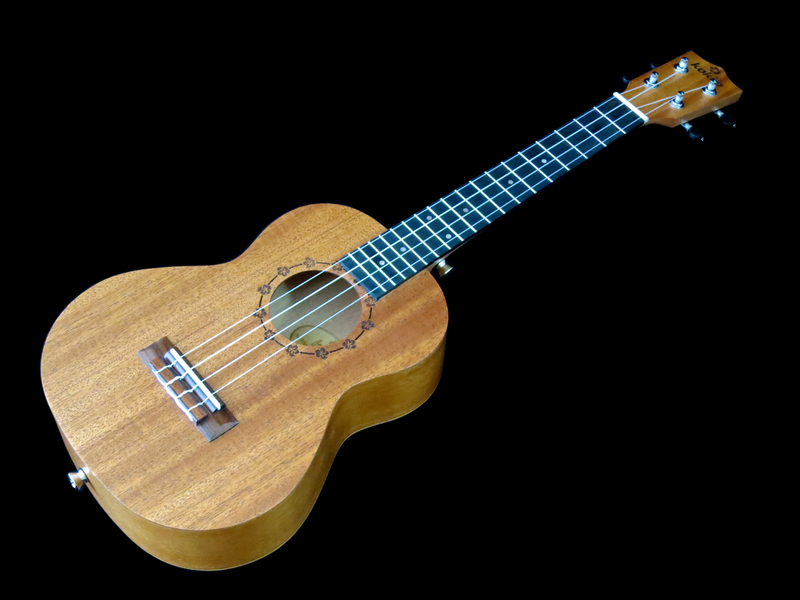 Welcome to Kitarablogi.com’s ukulele round-up! 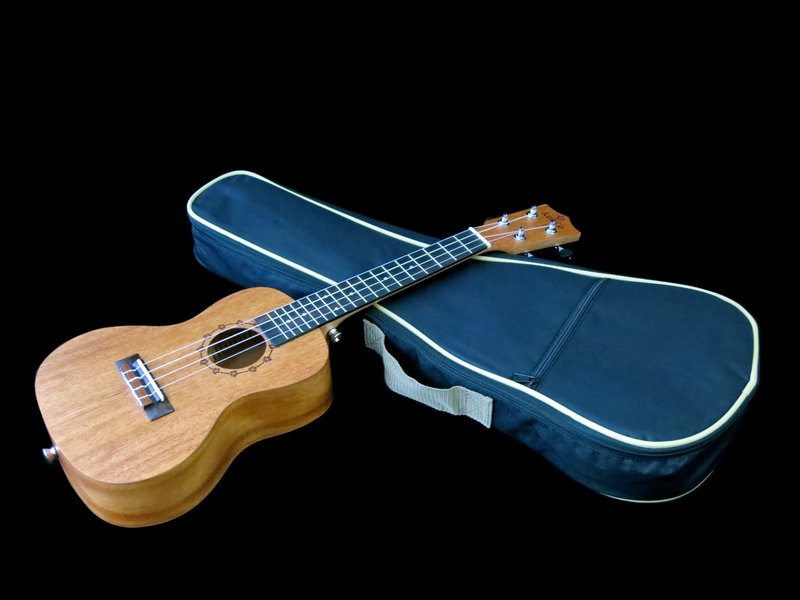 Summer’s just around the corner, and the uke is the perfect little instrument to take along to the beach or to a BBQ party. 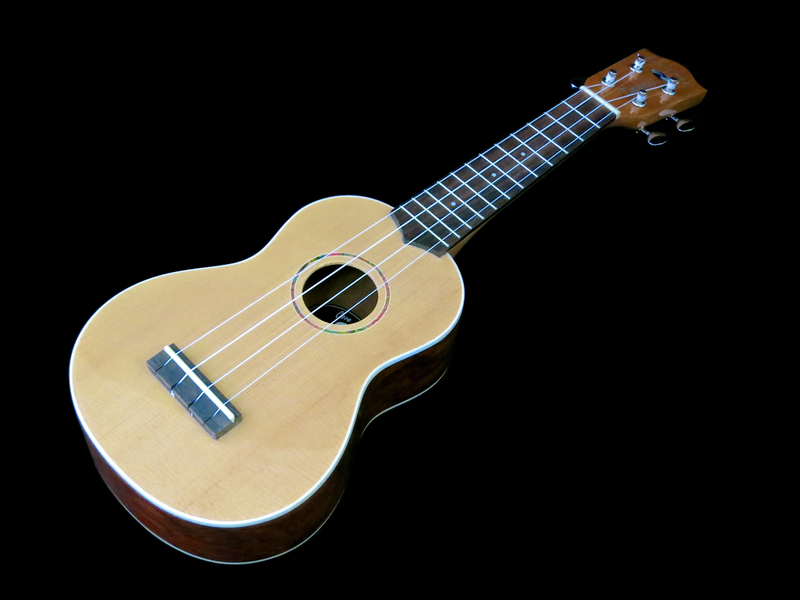 Originally, I had hoped to flesh out a more tightly defined round-up of ukuleles of a certain price and/or size. The new additions to the CITES-treaty, which deal with rosewood (among other things), and the still-growing popularity of the uke here in Finland, have forced me to make concessions, taking into account current availability. 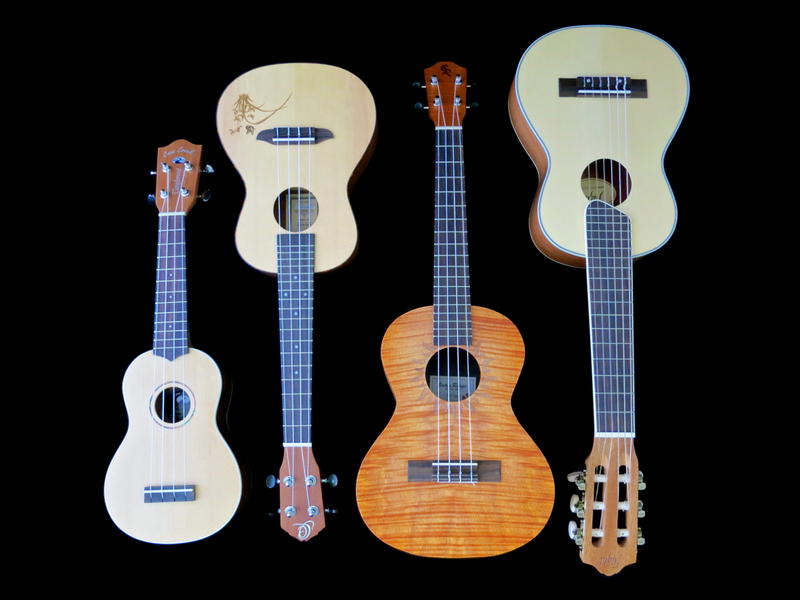 This is a round-up of affordable ukuleles between 80 and 290 €. 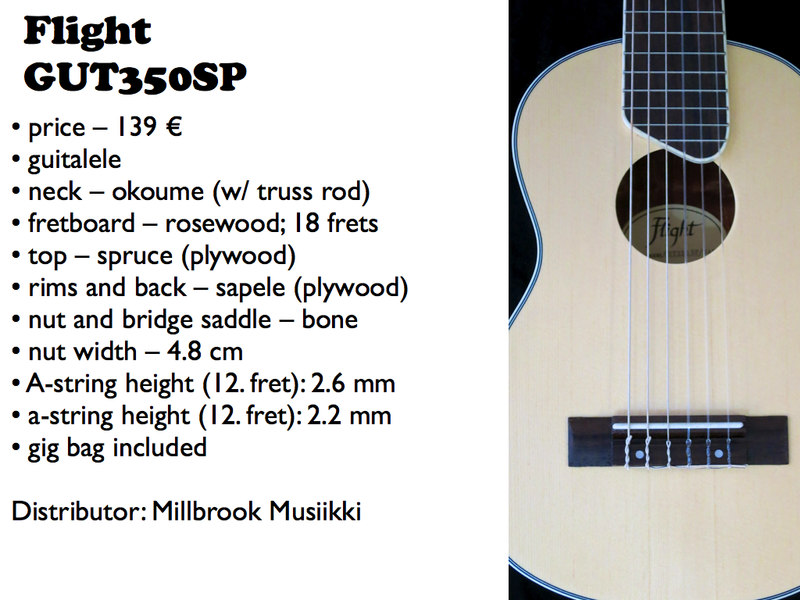 The aim of this article is not to find the ”best” or ”worst” instrument, but rather to give you a cross-section of currently available brands and models in this price segment in Finland. 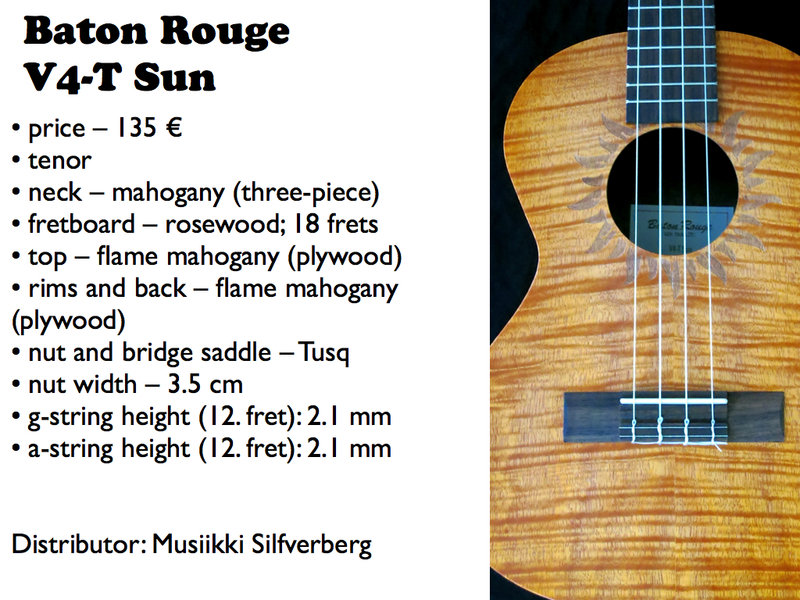 Baton Rouge is a relatively young brand from Germany, specialising in ukuleles and steel-string guitars. Baton Rouge do their R&D and final quality control in Germany, but the instruments are actually made in their own factory in China. We received our review instruments from Vantaan Musiikki. Baton Rouge’s V4 Sun model range comes with gorgeous looking bodies made from curly mahogany. 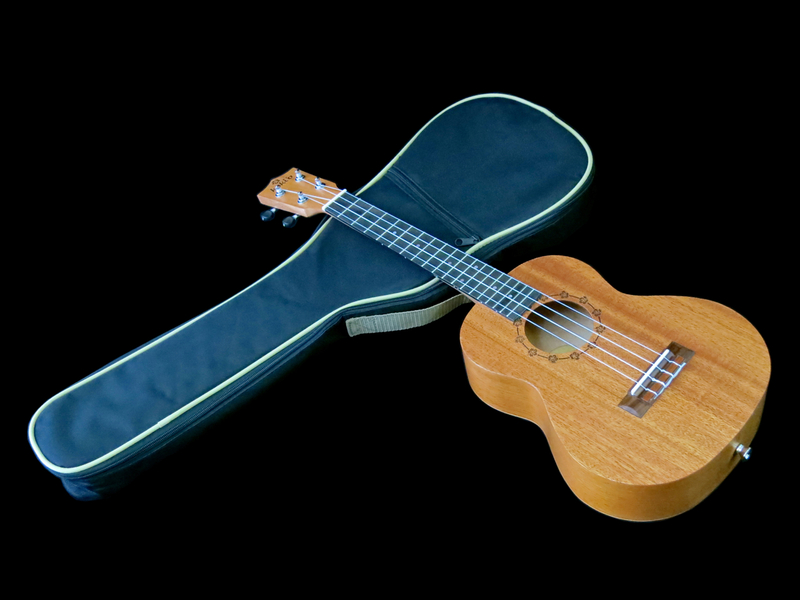 The very thin satin finish gives these ukes a satisfying tactile feel. V4 Sun instruments come with bodies that are deeper than standard. They also feature arched laminated backs. The sun-moniker is a nod to the beautiful laser-engraved soundhole rosette. The concert-sized V4-C Sun plays really well. 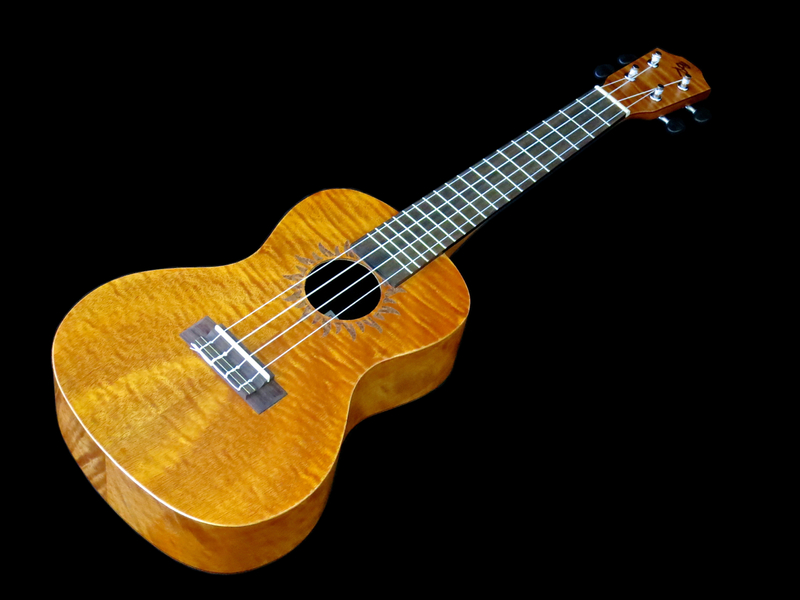 The neck profile is a very soft V.
Thanks to its deep body the V4-C Sun has a louder and deeper voice than you’d might expect from a concert uke in this price range. If anything, the review sample of the Baton Rouge V4-T Sun looks even more luxurious than its smaller sibling. Tenor ukuleles often find their way into the hands of fingerpickers, many of whom prefer slightly wider nut widths, like 38 or 40 mm. Despite its regular nut width of 35 mm the V4-T Sun’s neck never feels cramped. Sadly, our review instrument suffered from a slightly too sharp neck angle, making the action impossibly low. I shimmed the bridge saddle for a much more manageable string height of a little over two millimetres, which put an end to string buzz and rattling. I’ve played a number of Baton Rouge guitars and ukes and have never before noticed any neck angle problems, so I’d write this off as ”the one that got away”. The V4-T Sun’s neck profile is a rounded D.
With the shimmed bridge saddle the V4-T Sun displayed a healthy, warm and big tone. 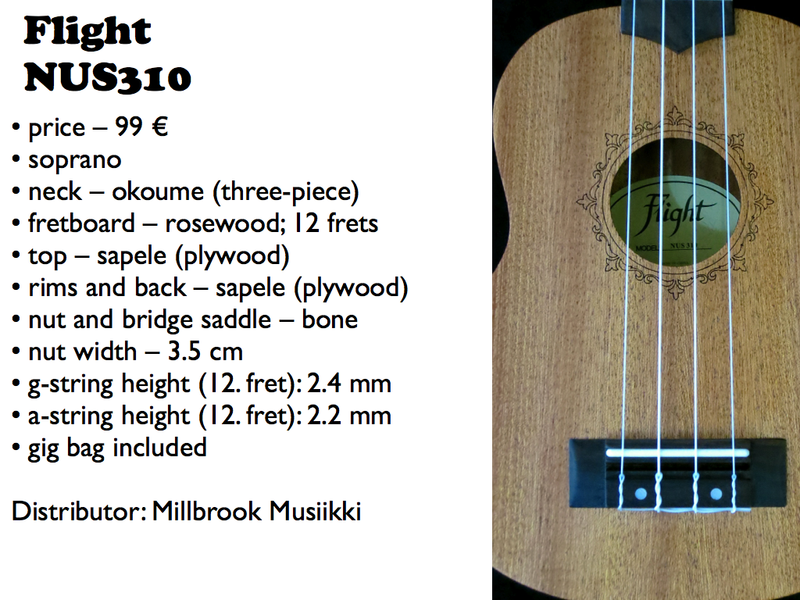 Flight is a Chinese guitar and ukulele brand that is still quite new in Finland. 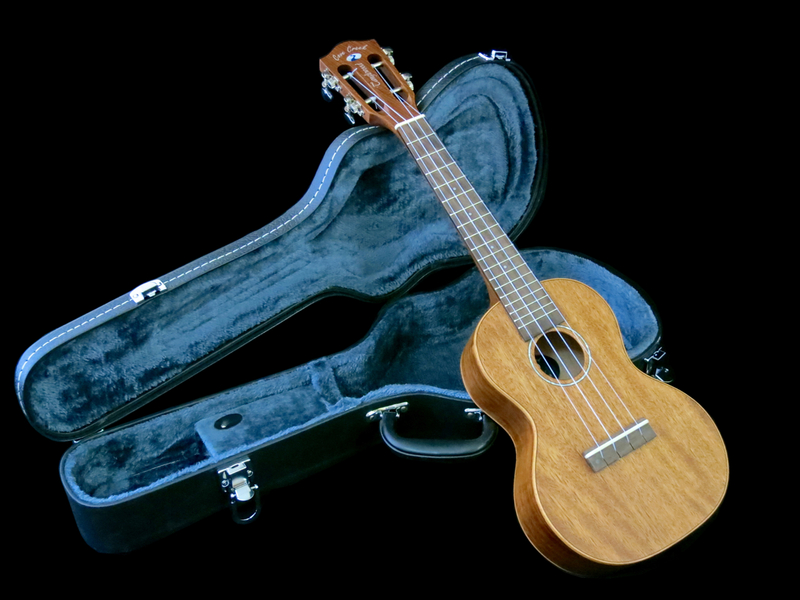 In addition to its standard models Flight also offers aged ukuleles, as well as officially licensed Elvis Presley models. The guitalele (also often spelled guitarlele) is the newest trend on the ukulele market, and marks something of a return to the uke’s roots. 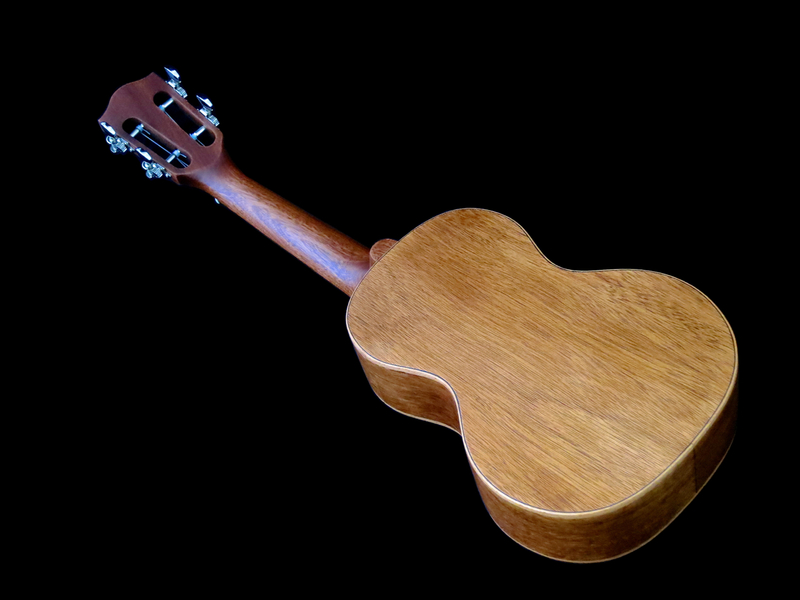 European immigrants brought their ”travel guitars” with them to their new home of Hawaii. 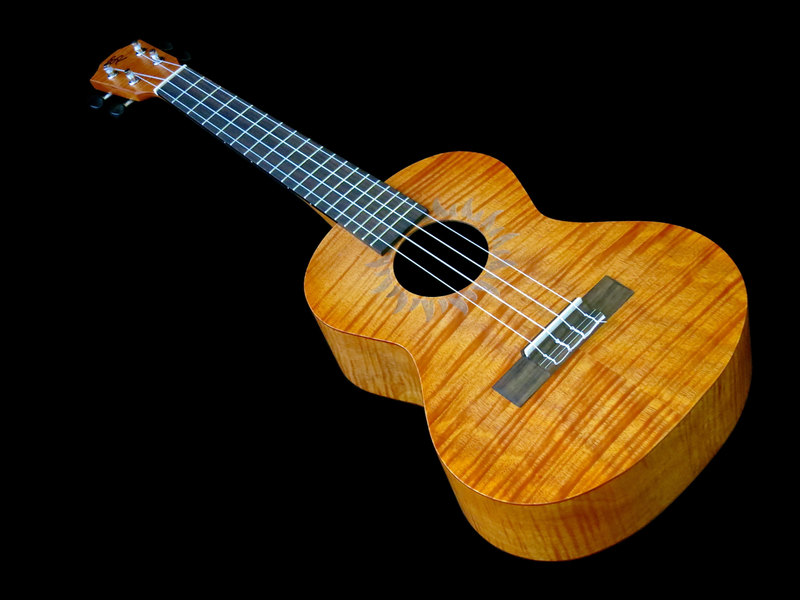 Those instruments then became the forefathers of the modern ukulele. A guitalele is a tenor-sized six-string instrument, which is tuned to A (A-a), like a guitar with a capo on the fifth fret. The Flight GUT350SP is a pretty and well made instrument. Despite its low price it even sports binding on the body and the fingerboard, as well as a neck with an adjustable truss rod. The GUT350SP’s neck has been crafted from okoume (often called Gabon mahogany). The soundbox features a laminated spruce top and laminated back and sides made of sapele. The workmanship is crisp and clean. 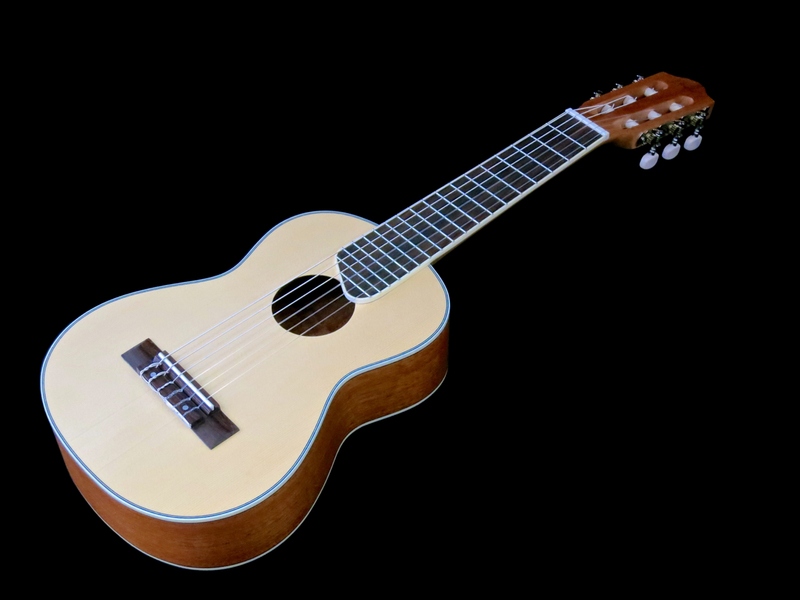 The neck profile is reminiscent of a classical guitar – flattish and a bit angular. The instrument plays very well. Flight’s GUT350SP maybe isn’t the loudest guitalele I’ve ever played, but it wins you over with its pretty voice and spot-on intonation. 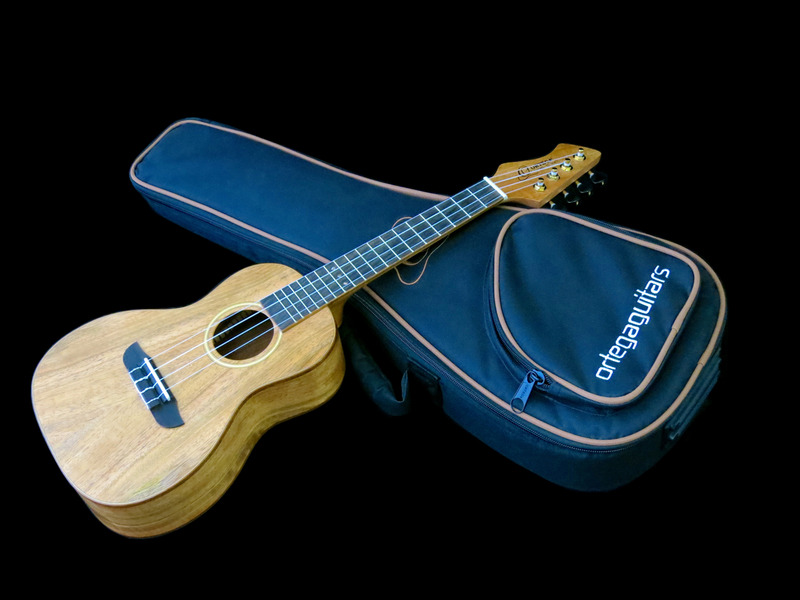 The Flight NUS310 is an affordable soprano uke, and it even comes in its own stylish tweed bag. The NUS310’s body is clearly wider than on most sopranos, in order to add a smidgen more bottom end to proceedings. 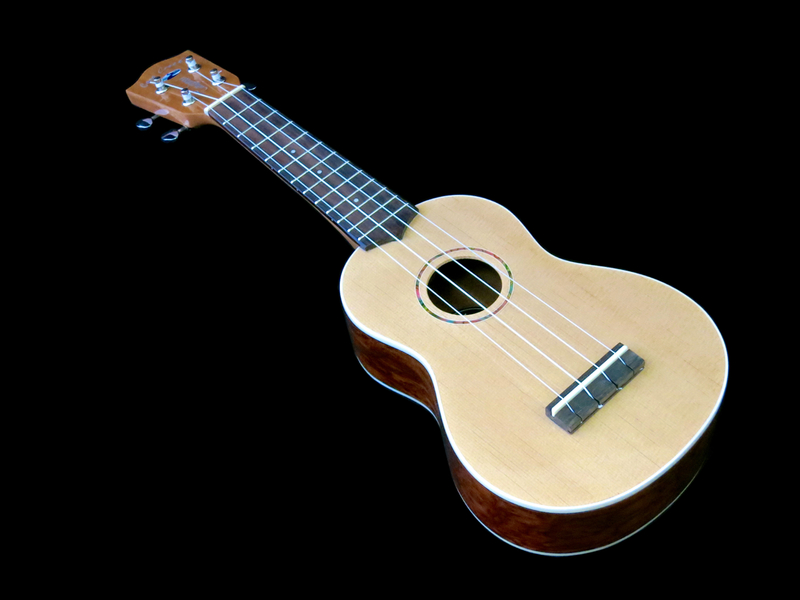 This is a well-made little instrument with effortless playability. 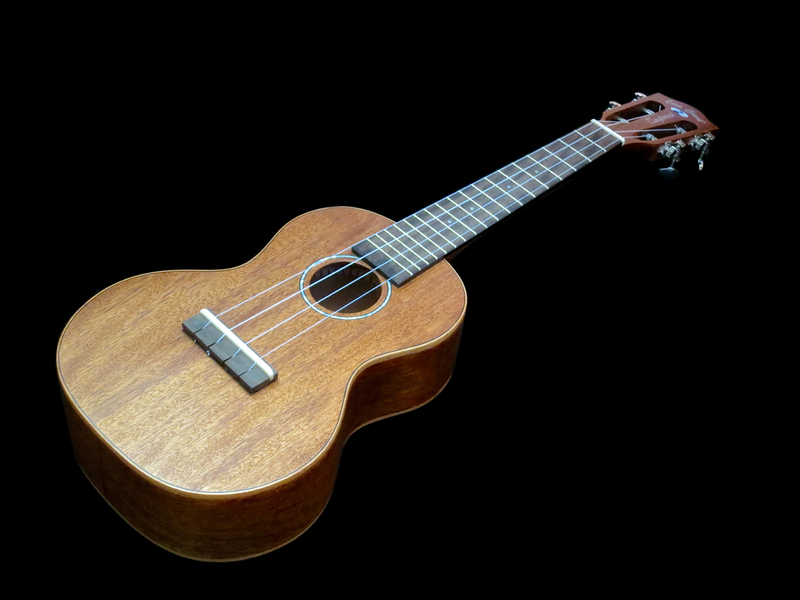 The neck profile is a rounded C.
In my opinion the Flight NUS310 is a cool little soprano uke, offering a vintage-type sound and good intonation. 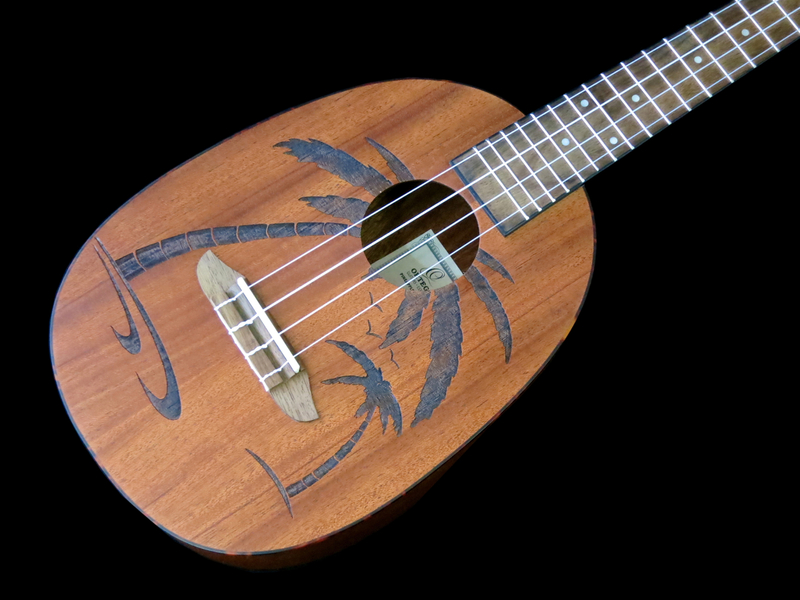 The Koki’o brand belongs to German uke-specialists RISA, who are best known for their electric and travel ukuleles. Koki’o is the Hawaiian name for the islands’ national flower the Hawaiian hibiscus. The brand offers a wide variety of different models. 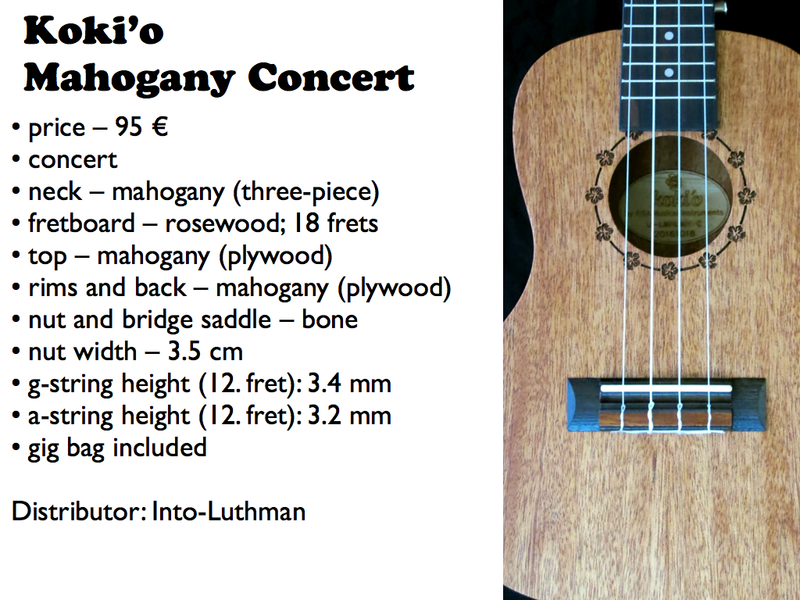 The Koki’o Mahogany Concert is a well-made affordable concert ukulele. The fretboard sports black binding. 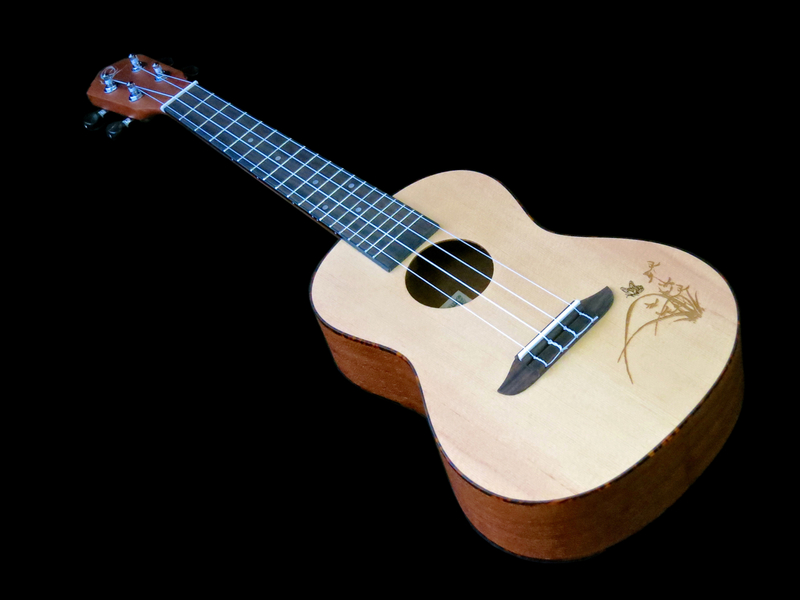 The rosette is made up of koki’o flowers, which have been laser-engraved into the uke’s mahogany top. 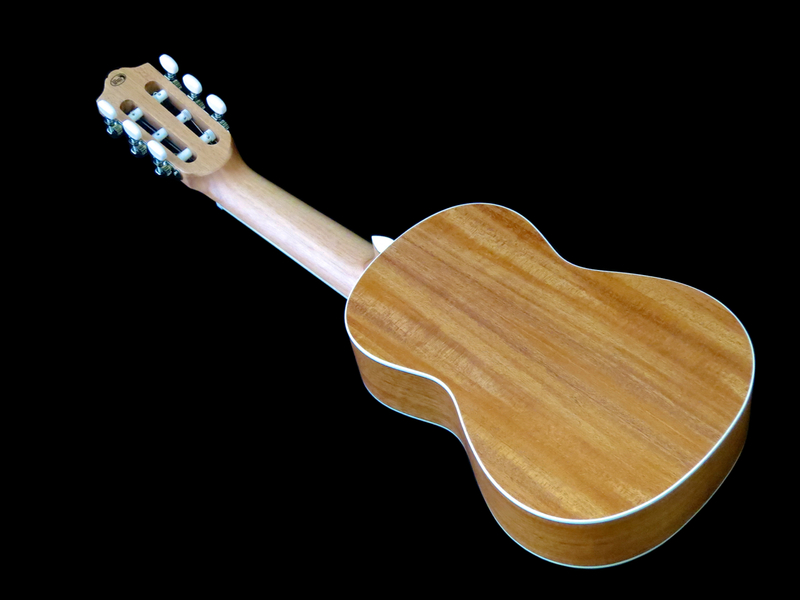 The Mahogany Concert comes with a deeper-than-standard body with an arched back. 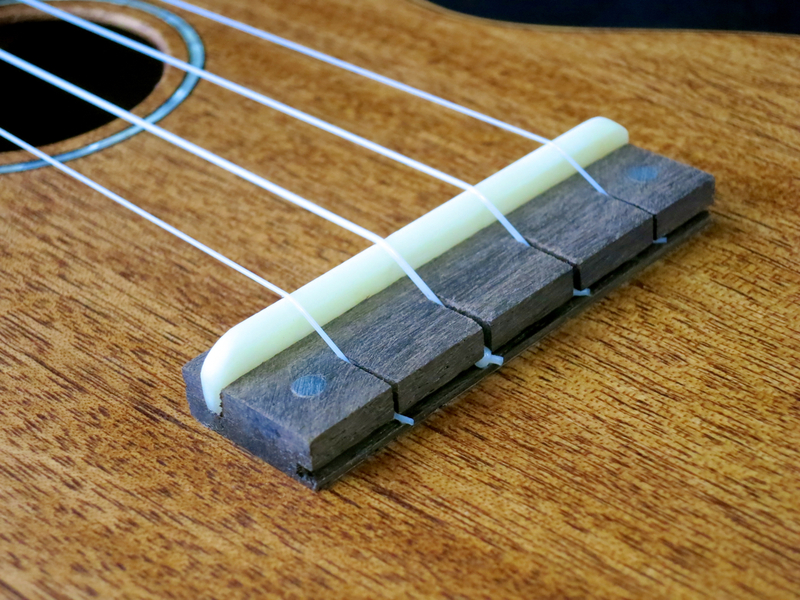 All Koki’o ukuleles come with two strap buttons installed. A very decent gig bag also comes with the instrument. 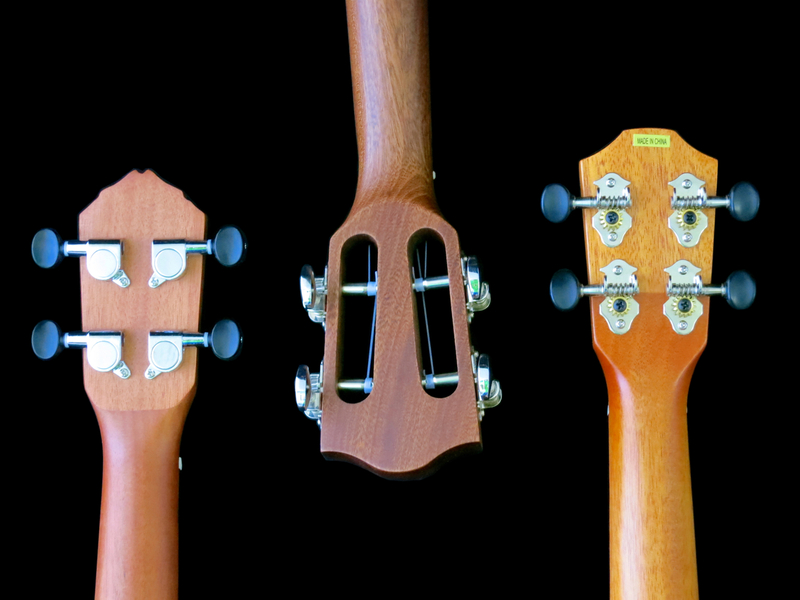 The neck profile is a comparatively thin, oval C.
The Koki’o Mahogany Concert sings with a beautiful and strong voice. 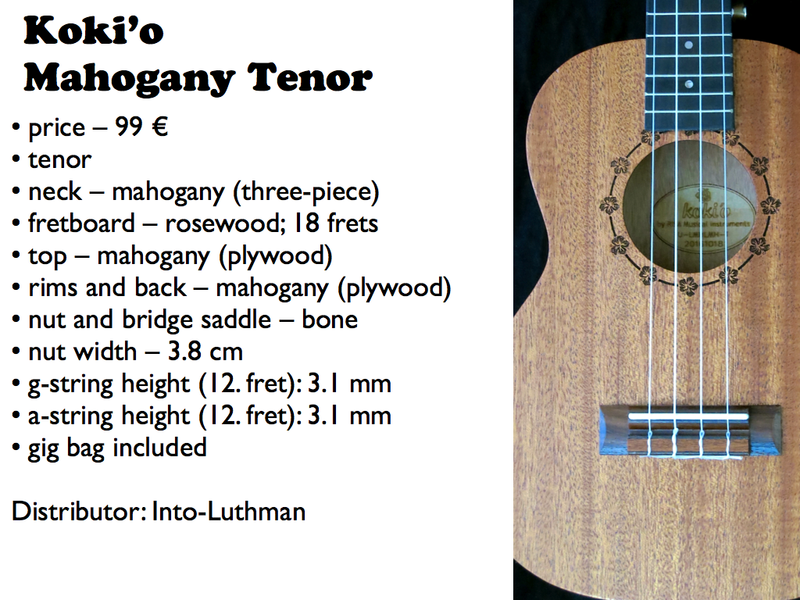 The Koki’o Mahogany Tenor is the Concert’s larger brother. 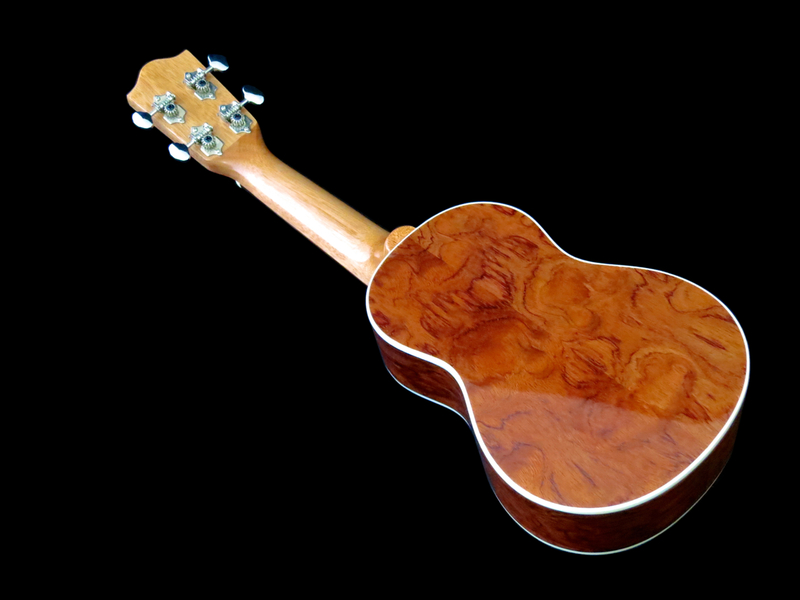 In terms of features, the Mahogany Tenor is virtually identical to the Concert, save for a slightly wider neck. Our review sample must have slipped through quality control, because it comes with a strange cosmetic quirk. 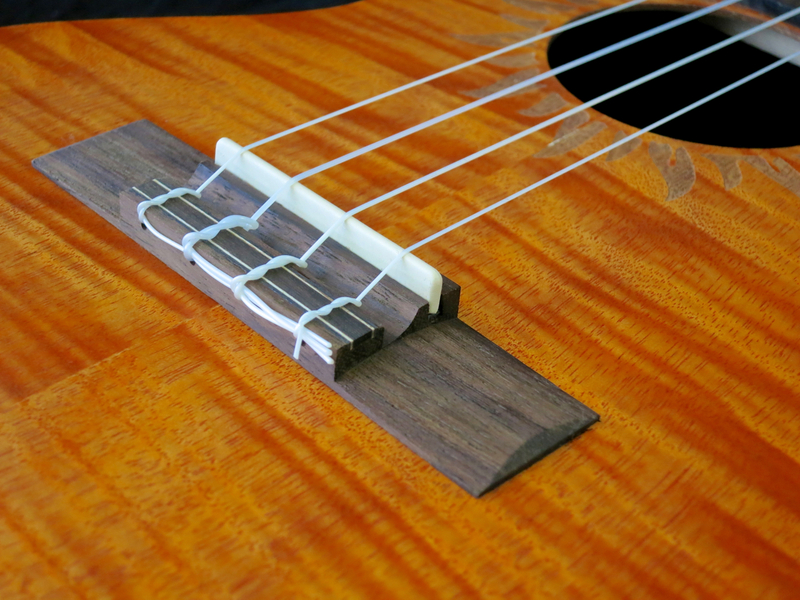 The body’s sides look like they’ve been bandsawed to a regular ukulele rim depth, before the worker realised his (or her) mistake, and then glued the pieces back on. The result is a very clean and thin saw/glue line all around the body. 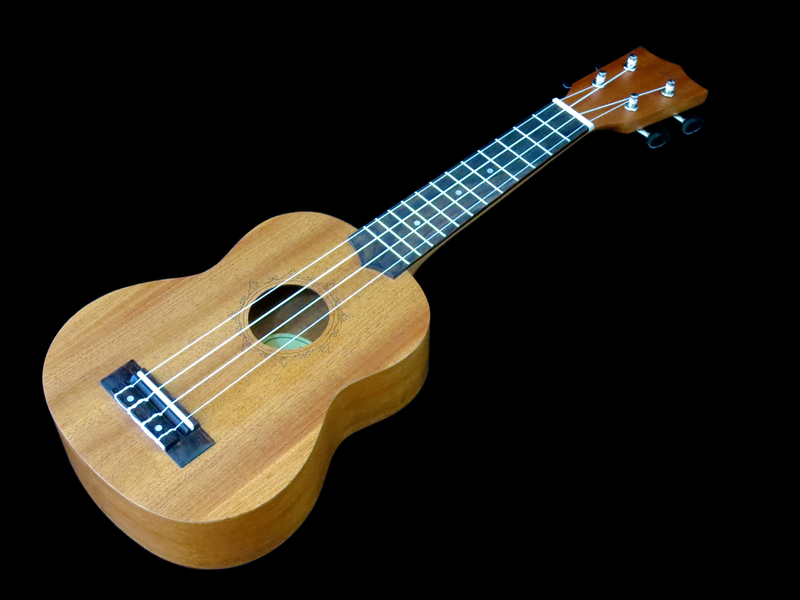 Structurally, there’s nothing wrong with this uke, it plays very well, but it just looks funny. 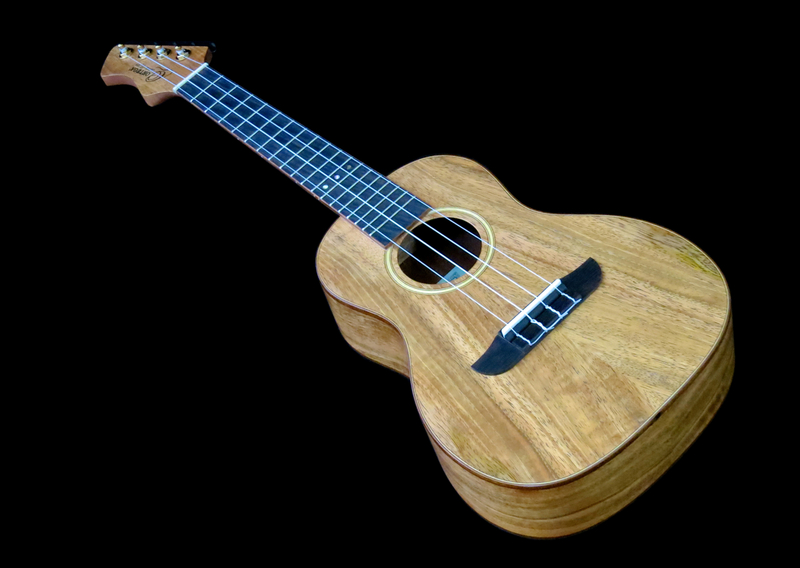 The Koki’o Mahogany Tenor has a chunky sound with a slightly husky mid-range. Ortega is a large maker of acoustic string instruments, combining German engineering and quality control with Chinese production. 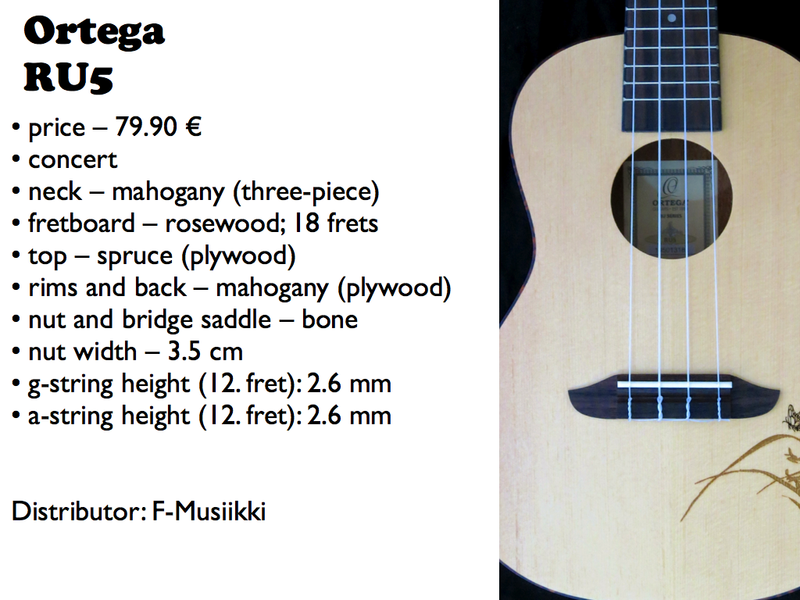 Ortega’s RU5 is the cheapest instrument in this round-up, but this isn’t borne out by its high standard of workmanship. 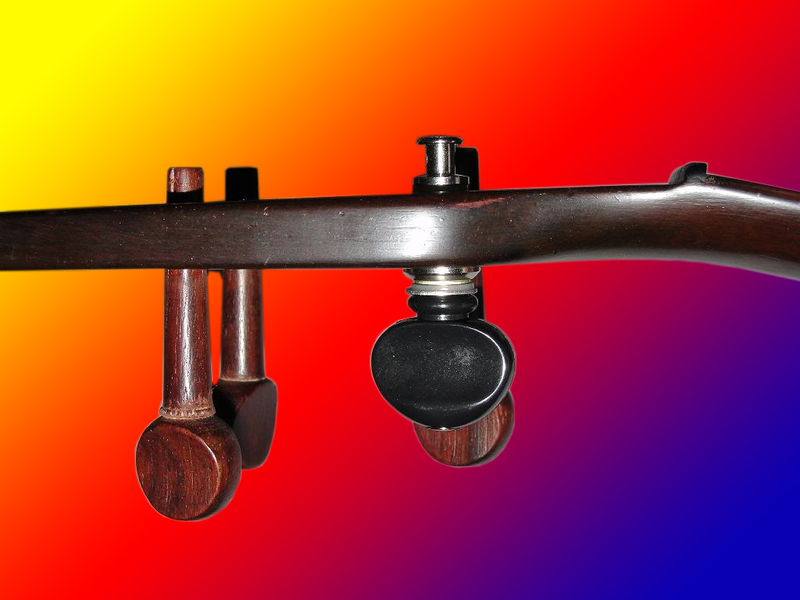 This is a surprisingly well-made and well-playing little instrument. There’s black binding around the fretboard, while the body has received tasty looking binding in faux tortoise shell. The graphics in the lower bout of the spruce top have been made with a laser. The RU5’s neck profile is a rounded D. The playability of this affordable concert model is great. The Ortega RU5 has a strong and open voice with a nice dose of clarity. 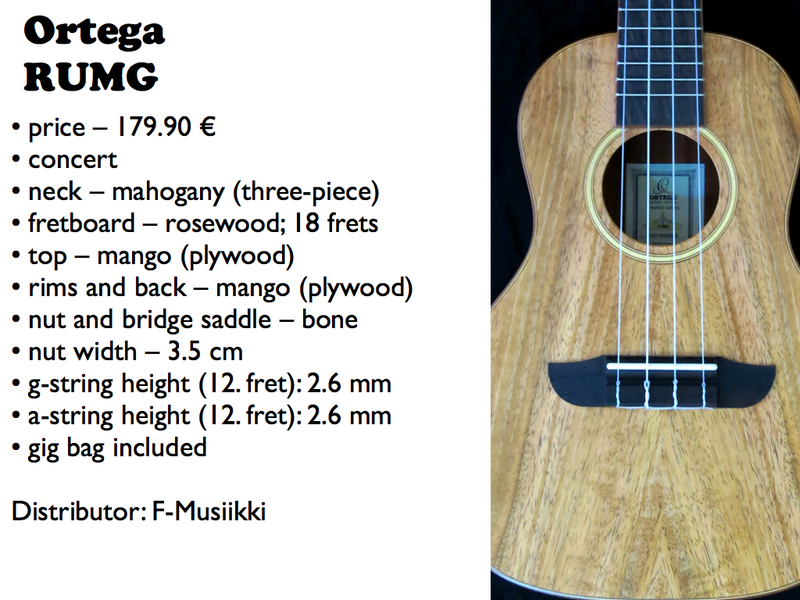 Ortega’s new model, the RUMG, is a concert-sized uke with a reverse ”electric” headstock, and a body made from laminated mango. 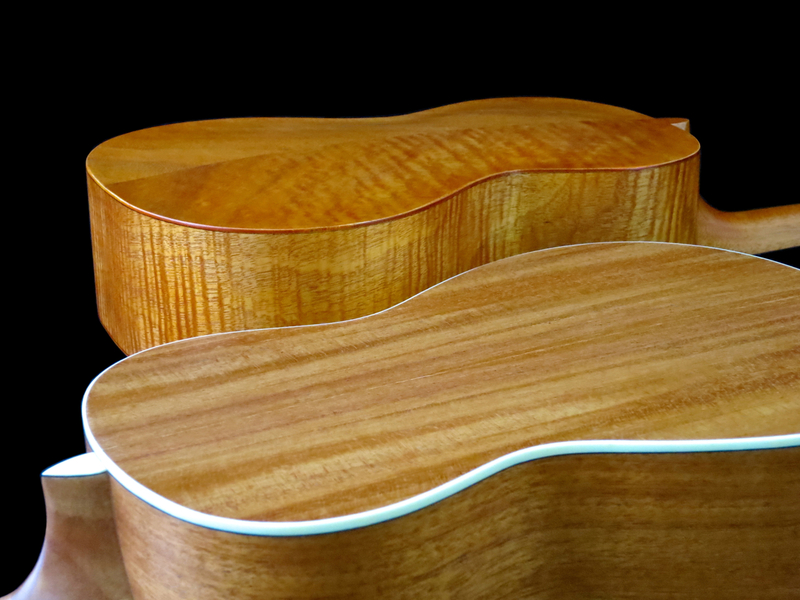 Mango may seem an interesting choice, but the woodgrain looks a lot like very light koa. 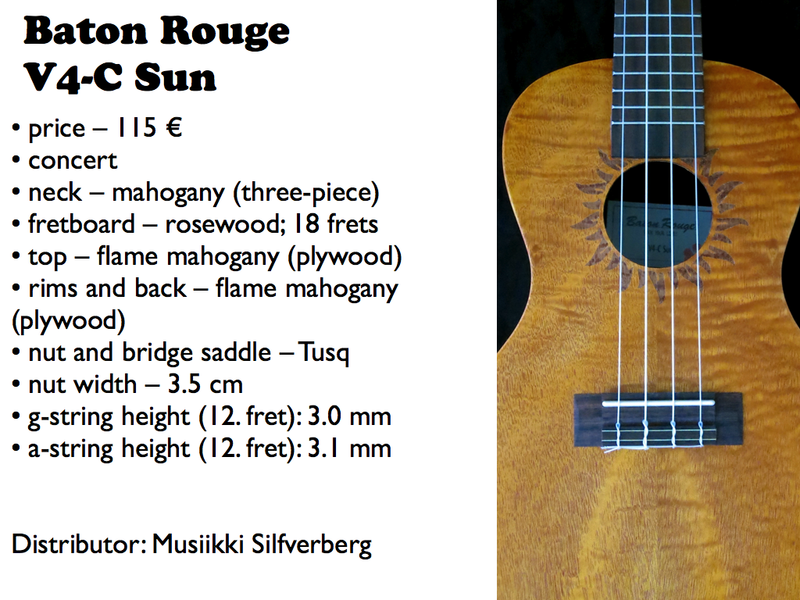 For the slightly higher price tag of the RUMG, you will get wooden binding and the nicest gig bag in this round-up, too. The neck feels great with its profile being a mix of soft V and oval C.
Ortega’s RUMG is a real shouter with a warm, full-bodied mid-range, punching well above its price bracket. 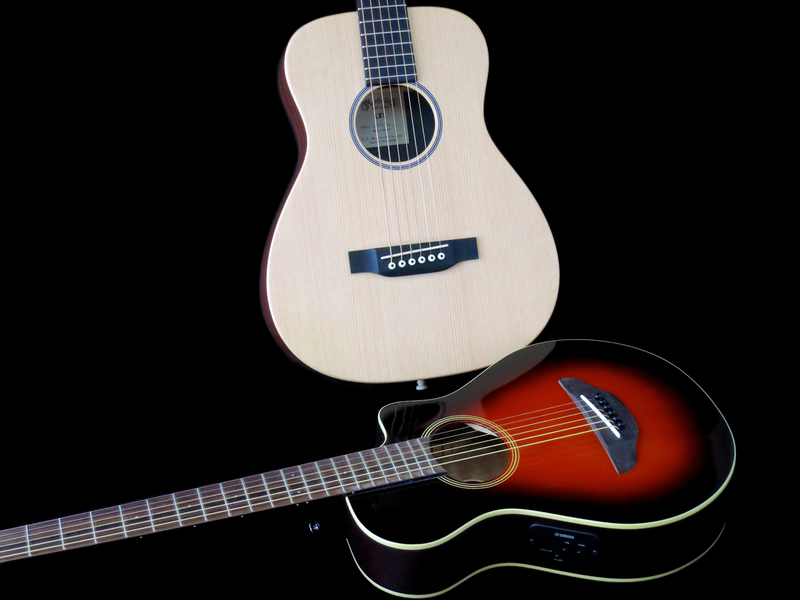 Tanglewood is Britain’s best-selling brand with a huge range of affordable to mid-price string instruments, which are built in the Far East. 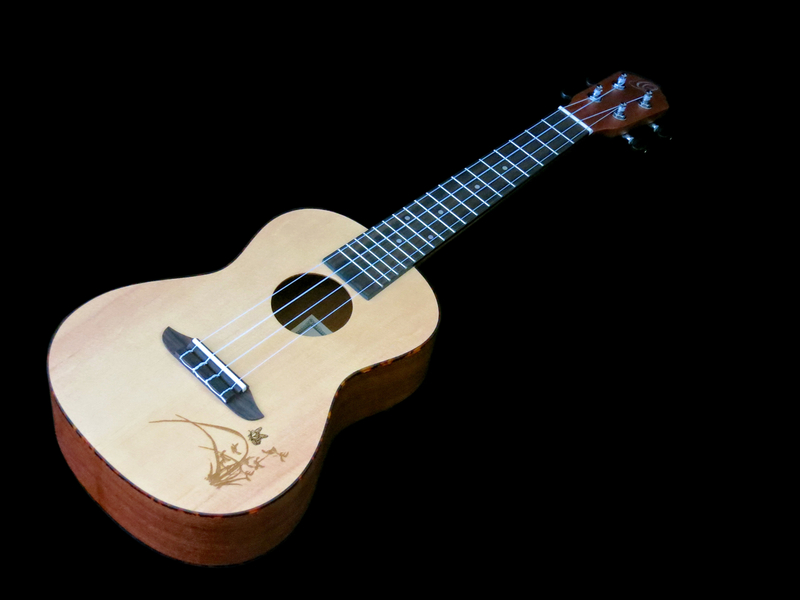 Tanglewood’s portfolio includes four different ukulele model ranges, of which Cove Creek is probably the most vintage-inspired. 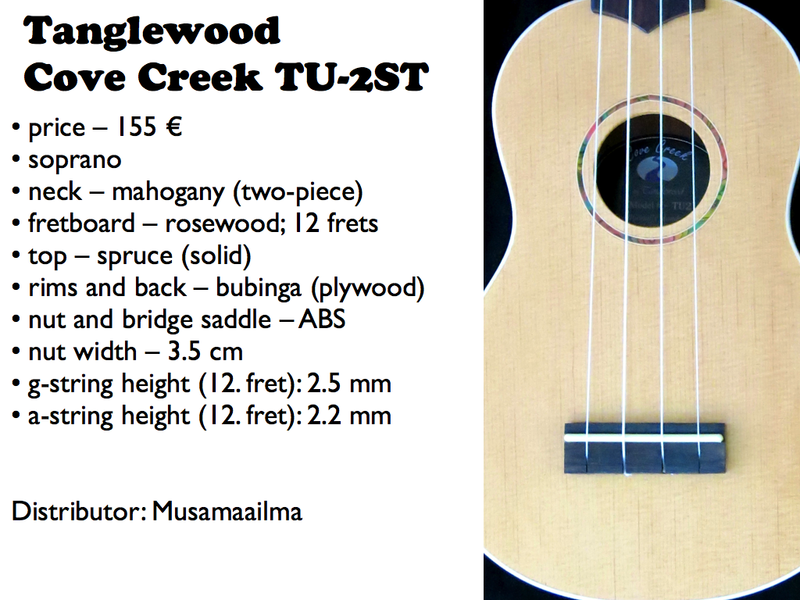 Tanglewood’s Cove Creek TU-2ST is the only gloss-finished uke in this round-up. This soprano’s basic design stays true to the classics, save for the wood choices for the soundbox. There’s a solid spruce top, coupled with back and sides made of laminated bubinga. The workmanship on the TU-2ST is extremely crisp. This soprano looks and plays great. The neck profile on this Cove Creek is comfortably round and clubby. A solid wood top naturally requires some playing in before ”opening up”, but I can state that the Cove Creek TU-2ST sounded great right out of the box. For a delicious vintage-inspired soprano sound you need not look any further. 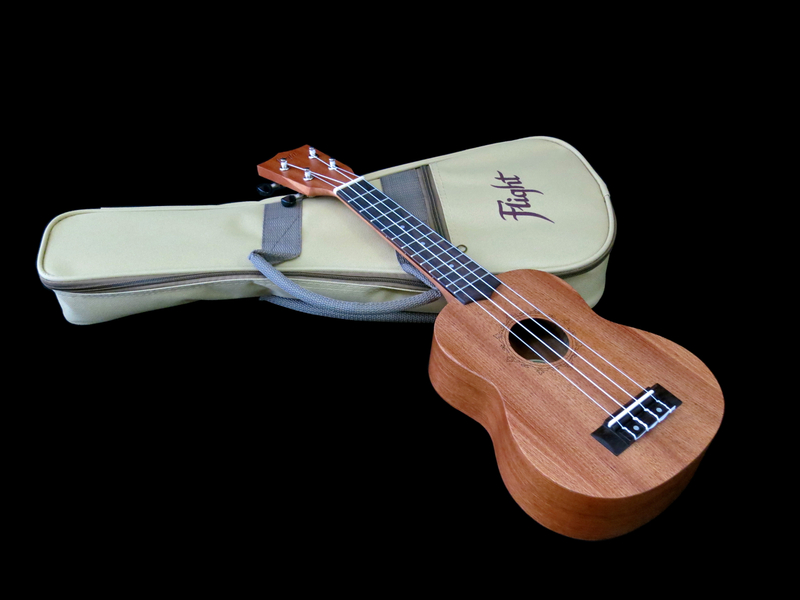 Tanglewood’s Cove Creek TU-10 is the only all-solid wood ukulele in this round-up, and it comes with its own case. 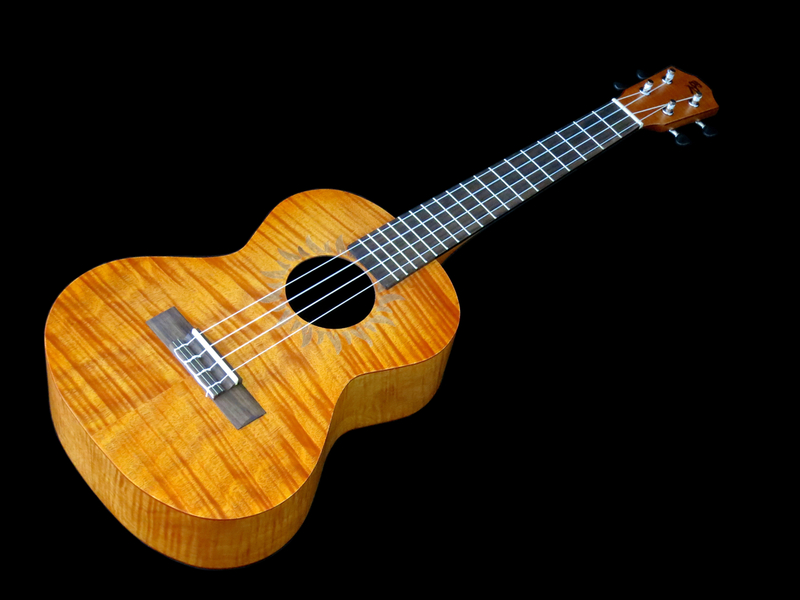 Even though the TU-10 is clearly the most ”expensive” uke in this round-up, it actually is quite a steal, if you take into account the professional features of this instrument, like its one-piece mahogany neck. 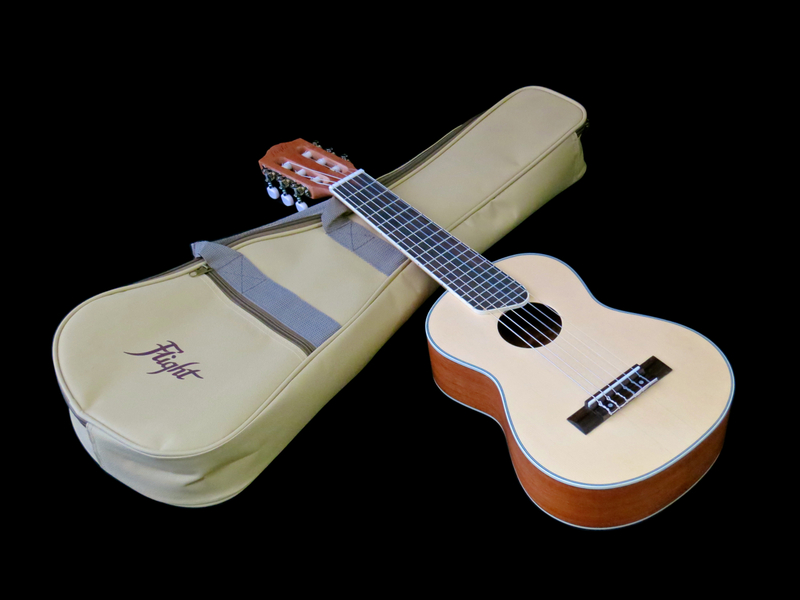 The Cove Creek TU-10 clearly is an homage to the classic period of the ukulele with its open headstock, its maple binding, its pearl rosette, and its rich satin finish. The neck profile is a medium-thick U. 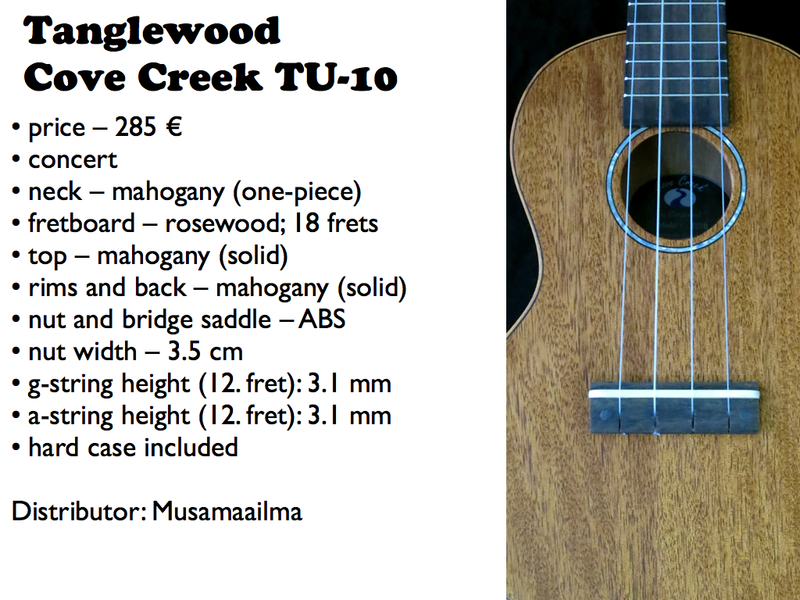 The Tanglewood Cove Creek TU-10 offers you warm clarity and dynamic punch straight out of the box. 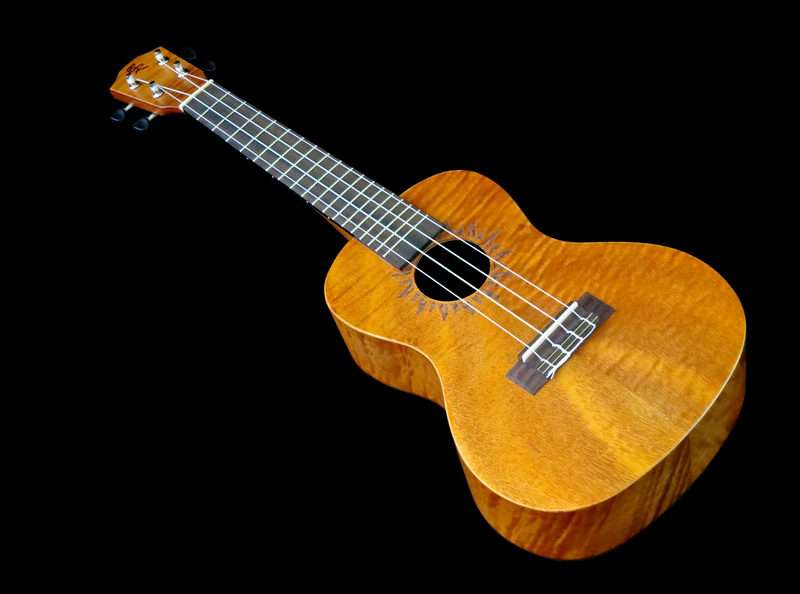 As it is an all-solid uke its sound will only get better the more you play it. 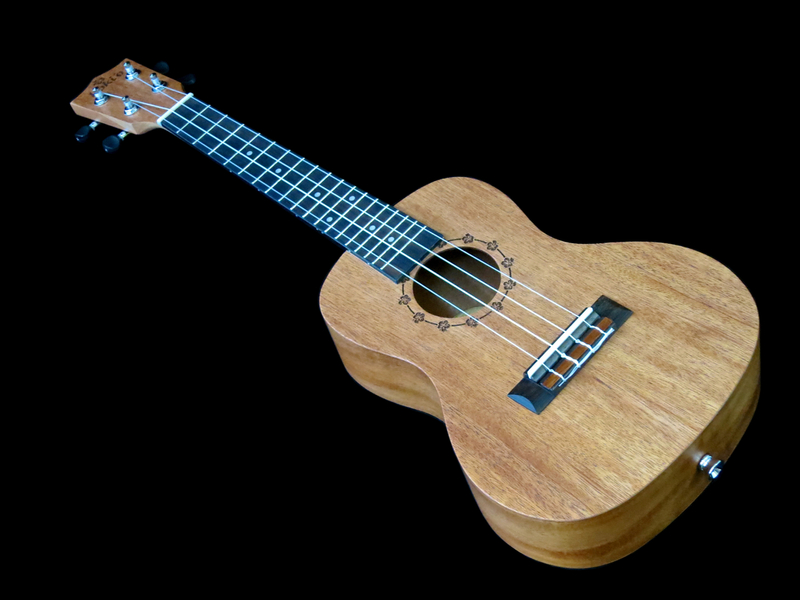 Looks like it’s a great time for buying your first ukulele. You can find decent instruments even in the sub-100 € price bracket that will play and sound well. 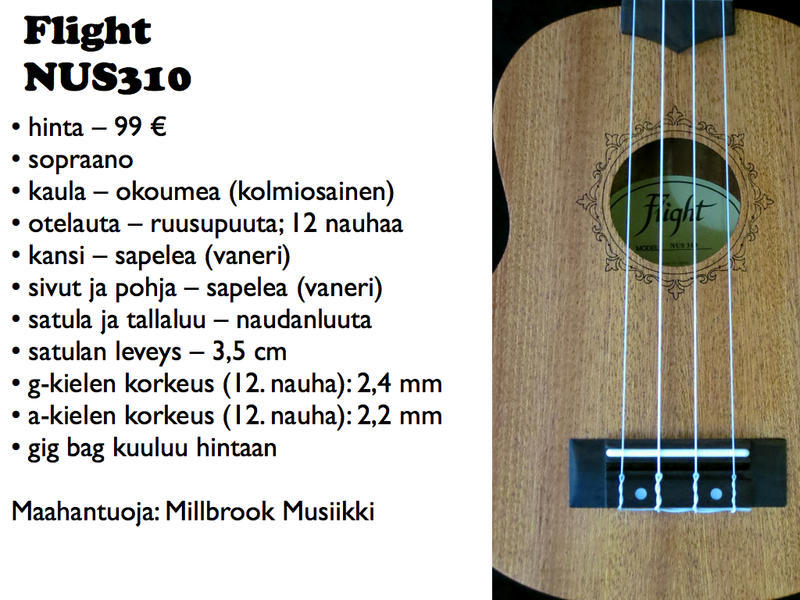 There’s also a wide variety of different brands and different uke sizes available in Finland these days. What are you waiting for? Tervetuloa Kitarablogi.comin ukulelekatsaukseen! Kesä on jo ovella, ja ukulele on täydellinen pikkusoitin rannalle, mökille tai grillijuhlaan. Aluksi suunnittelin tekeväni tarkemmin rajatun katsauksen, jossa olisi ollut mukana kultakin valmistajalta kaksi, speksien ja hinnan perusteella, tarkoin valikoitua mallia. Juuri voimaan tulleet uudet lisäykset CITES-sopimukseen, jotka koskevat mm. ruusupuuta (palisanteria), yhdistettynä ukulelen suosion räjähdysmäiseen kasvuun, pakottivat minut muuttamaan suunnitelmiani maahantuojien varastotilanteita mukaileviksi. Tässä katsauksessa esitellään edullisia ukuleleja, joiden hinnat vaihtelevat 80 ja 290 euron välillä. Katsauksen tarkoituksena ei ole löytää ”paras” soitin, vaan sen sijaan tehdä pienimuotoinen markkinan läpileikkaus, josta selviää millaisia ukuleleja tällä rahalla saa. Baton Rouge on suhteellisen uusi merkki Saksasta, joka on erikoistunut ukulelejen lisäksi teräskielisiin kitaroihin. Soittimien suunnittelu ja laadunvalvonta on saksalaista käsialaa, mutta soittimet valmistetaan firman omalla pajalla Kiinassa. Saimme testisoittimet lainaan Vantaan Musiikilta. Baton Rougen V4 Sun -malliston soittimet ovat erittäin näyttäviä niiden kauniiden loimumahonkirunkojen ansiosta. Mattalakatut puupinnat on jätetty tarkoituksella hieman huokoisiksi, mikä antaa Baton Rouge -ukuleleille mukavan luonnollisen tuntuman. V4 Sun -soittimissa on erikoissyvät, kaarevapohjaiset rungot. Sun-sana viittaa kauniiseen, auringon muotoisen rosettiin, joka on kaiverrettu kanteen laserilla. Konserttikokoisen V4-C Sun -mallin soitettavuus on erinomainen. Kaulaprofiiliksi on valittu hyvin pehmeä, keskipaksu V.
Suuren koppansa ansiosta V4-C Sun soi hieman isommalla ja syvemmällä äänellä kuin ehkä odottaisi tämän hintaluokan konserttiukulelelta. Testiin saapunut Baton Rouge V4-T Sun näyttää jopa vielä prameammalta kuin sen pienempi sisar. Tenoriukulelet nähdään usein sormisoittajien käsissä. Monet heistä suosivat hieman leveämpiä otelautoja, 38 tai 40 mm satulan leveydellä, mutta 35 mm satulasta huolimatta V4-T Sunin kaula ei tuntunut minusta lainkaan ahtaalta. Testisoittimessa oli valitettavasti hieman liian jyrkkä kaulakulma, minkä vuoksi se saapui testiin mahdottoman matalalla kieltenkorkeudella. Shimmaamalla tallaluuta hieman sain kielten korkeutta nostettua yli kaksi millimetriä, jolloin kielet lakkasivat rämisemästä nauhoja vasten. Olen kokeillut jo useampaa Baton Rouge -kitaraa ja -ukulelea, enkä ole tähän mennessä kohdannut ongelmia kaulan kulmissa – pidän tätä siis harvinaisena yksilövikana. Kaulaprofiili on V4-T Sun -mallissa pyöreä D.
Shimmauksen jälkeen V4-T Sun soi erittäin terveellä ja voimakkaalla äänellä. Flight on kiinalainen kitara- ja ukulelebrändi, joka on meille Suomessa vielä melko uusi tuttavuus. Perusmallien lisäksi Flight tarjoaa myös relikoituja ukuleleja, sekä virallisia Elvis Presley -malleja. 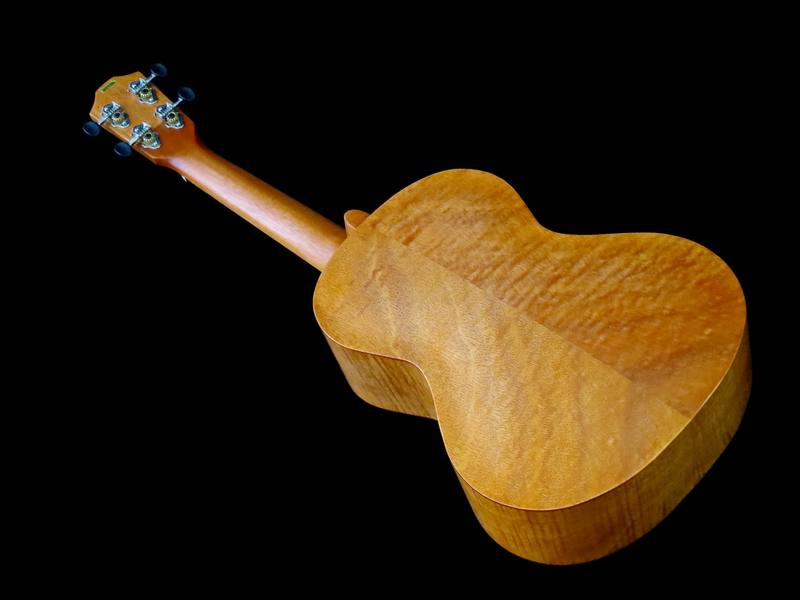 Guitalele (kirjoitetaan myös usein guitarlele) on uusin suuntaus ukulelemarkkinoilla, vaikka se onkin tavallaan paluu ukulelen juurille. Eurooppalaiset maahanmuuttajat toivat aikoinaan omia ”matkakitaroitaan” mukanaan Havaijille, joista sitten ukulelet kehittyivät. Nykyaikainen guitalele on kuusikielinen soitin tenorikokoisella kopalla. Viritys vastaa kitaraa, jossa on kapo viidennellä nauhalla (A-a). Flight GUT350SP on hyvin siististi tehty soitin, joka tarjoaa maltillisesta hinnastaan huolimatta reunalistoitukset kopassa ja otelaudassa, sekä säädettävän kaularaudan. GUT350SP:n kaula on veistetty okoumesta, joka tunnetaan myös nimellä gaboninmahonki. Koppa taas koostuu kuusikannesta ja sapellipohjasta (ja sivuista). Työnjälki on kauttaltaan siistiä. Kaulaprofiili on lainattu klassisesta kitarasta – laakea ja suhteellisen leveä. Flightin soitettavuus on mukavan vaivatonta. 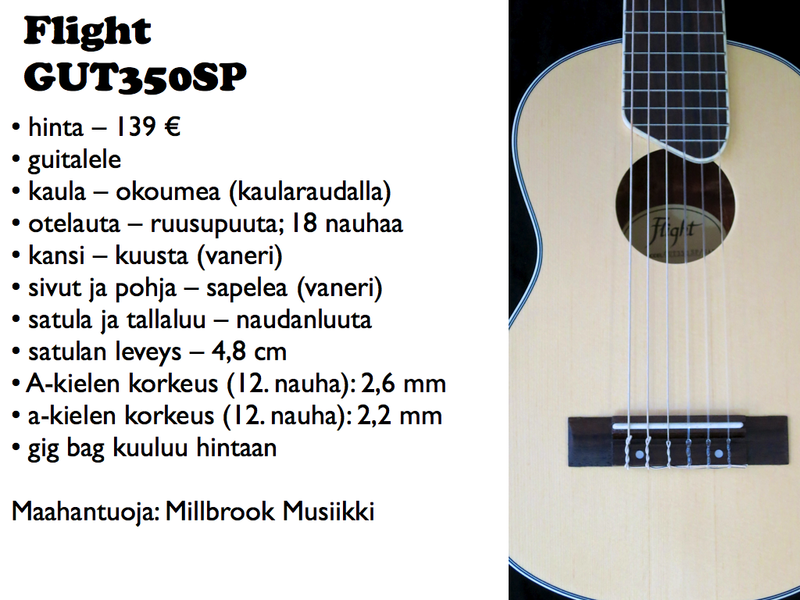 Flight GUT350SP ei ehkä ole kovaäänisin kaikista kokeilemistani guitaleleista, mutta sillä on hyvin kaunis ääni. Myös Flightin intonaatio on mukavasti kohdallaan. Flight NUS310 on edullinen sopraanoukulele, joka myydään omassa laadukkaassa tweed-bägissään. NUS310 eroaa keskivertosopraanosta leveämmällä rungollaan, jonka on tarkoitus lisätä pienikokoisen soittimen soundiin hieman muhkeutta. Työnjälki on hyvin siistiä ja Flightin soittotuntuma on mukava. Kaulaprofiiliksi on valittu pyöreä C.
Minun mielestäni Flight NUS310 on mainio perussopraano vintage-tyylisellä soundilla ja hyvällä intonaatiolla. Koki’o-brändin takana on saksalainen ukulelespesialisti RISA, joka on tunnettu erityisesti matka- ja sähköukuleleistaan. 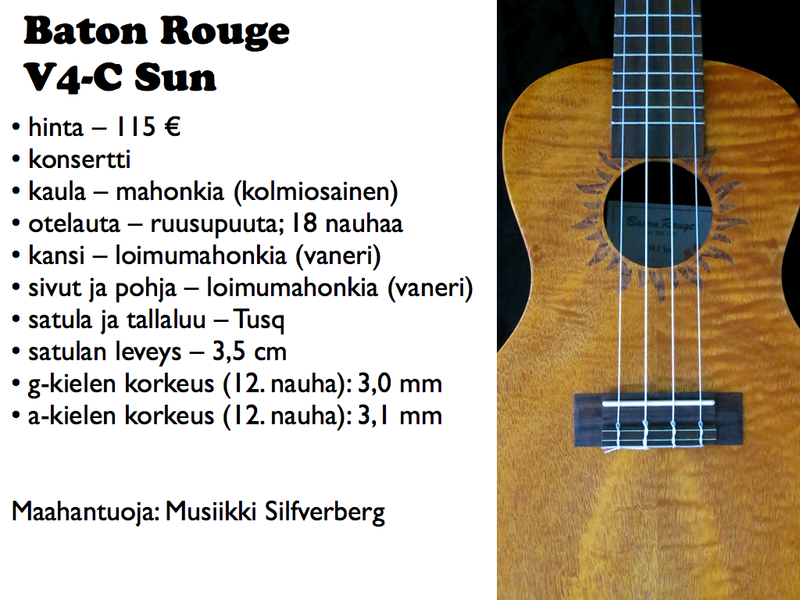 Koki’o on nimetty havajilaisen hibiskuksen mukaan, ja se tarjoaa laajan valikoiman akustisia ja mikitettyjä ukuleleja. Koki’o Mahogany Concert on hyvin siististi tehty, edullinen konserttiukulele. Otelauta on saanut koristeeksi mustan reunalistoituksen. Mallin rosetti koostuu koki’o-kasvin kukkasista, jotka on kaiverrettu laserilla mahonkikanteen. Mahogany Concertissa on perinteistä syvempi runko kaarevalla, muotoon prässätyllä pohjalla. Koki’o:n kaikissa soittimissa on kaksi hihnatappia valmiiksi asennettuna. Myös laadukas topattu pussi kuuluu hintaan. Kaulaprofiiliksi on valittu verraten ohut, ovaali C.
Koki’o Mahogany Concert soi hyvin kauniilla ja vahvalla äänellä. 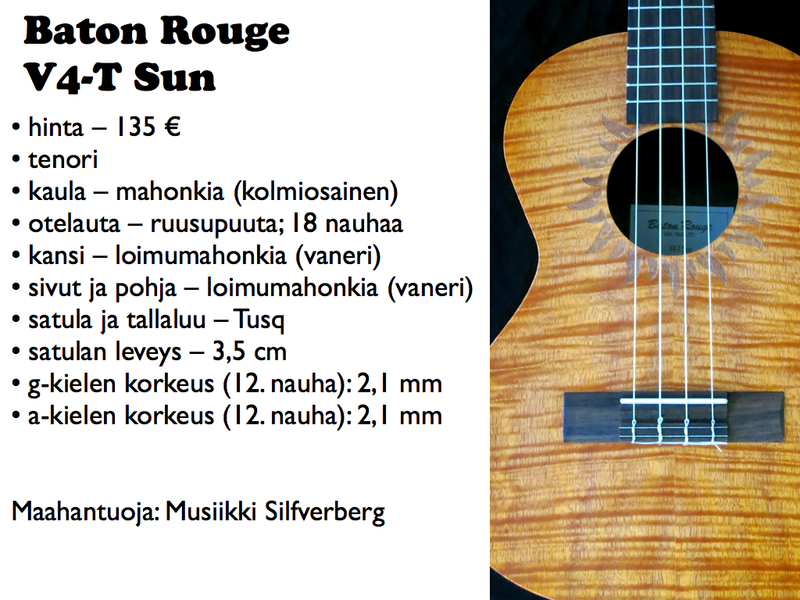 Koki’o Mahogany Tenor on edellä mainitun Koki’o:n tenorikokoinen veli. 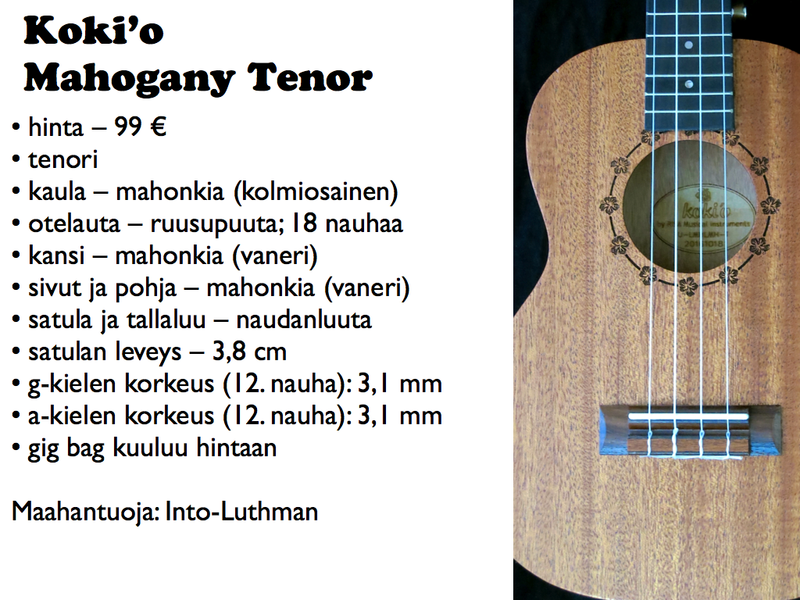 Ominaisuuksiltaan Mahogany Tenor vastaa lähes täysin Concertia, paitsi että Tenorissa on hieman leveämpi otelauta. Testiyksilö näyttää olevan ns. maanantaikappale, vaikka soittimen työnjälki on sinänsä hyvin siistiä. Ukulelen sivuissa on nimittäin nähtävissä hieno sahausjälki/liimasauma. Joku on tehtaalla ilmeisesti sahannut sivut ensin perinteiselle ukulelelle sopiviksi, tajunnut sitten virheensä ja liimannut sen jälkeen molemmat sivut taas siististi yhteen. Vika on ainoastaan kosmeettinen, eikä se vaikuta lainkaan Mahogany Tenorin hyvään soitettavuuteen. 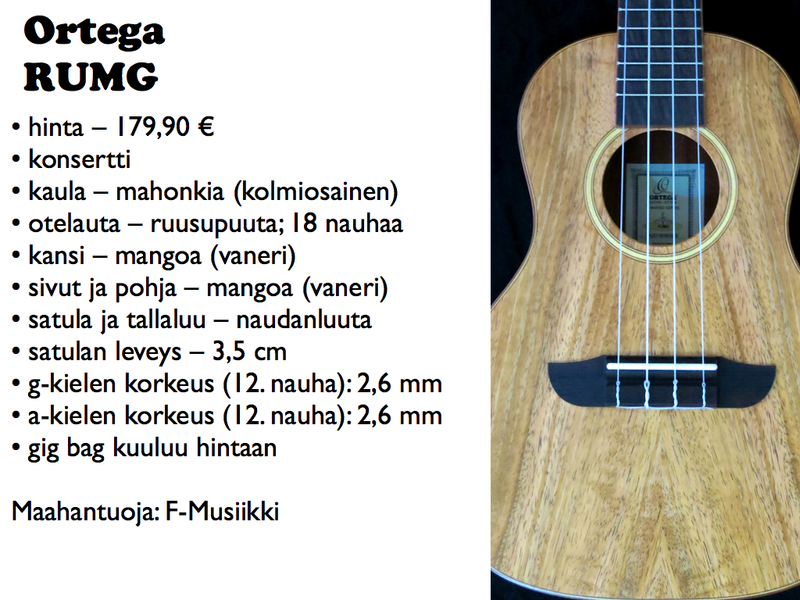 Koki’o Mahogany Tenor soi erittäin vahvalla, hieman savuisella äänellä. Ortega on iso, kielisoittimiin erikoistunut saksalainen brändi, joka yhdistää saksalaista suunnittelua ja laadunvalvontaa kiinalaiseen tuotantoon. Ortega RU5 on tämän katsauksen edullisin soitin, mitä on sen laadun perusteella vaikea uskoa. Työnjälki on ukulelen hintaan nähden erinomaisen siistiä. Otelauta on reunalistoitettu mustalla muovilla, kun taas kopan reunoja koristaa läpikuultava kilpikonna-kuvioitu muovilista. Kuusikannen grafiikka on kaiverrettu siihen laserilla. RU5:n kaulaprofiiliksi on valittu pyöreä D. Konserttimallin soitettavuus on erinomainen. Ortega RU5 soi kauniilla, selkeällä ja dynaamisella äänellä. Ortegan uutuusmalli RUMG on konserttikokoinen ukulele käänteisellä sähkökitaran viritinlavalla, sekä mango-puusta tehdyllä kaikukopalla. Mango vaikuttaa ensisilmäykseltä ehkä hieman epätavalliselta valinnalta, mutta sen ulkonäkö muistuttaa aika lailla hyvin vaaleaa koa-puuta. Epätavallisen puun lisäksi, tämän Ortegan hieman korkeampaan hintaan saa myös puiset reunalistoitukset otelaudan ja kopan ympärille, sekä tämän katsauksen selvästi laadukkaimman gigbagin. Kaulan profiili on mukavan tuntuinen sekoitus pehmeää V:tä ja ovaalia C:tä. Ortega RUMG:n armoton atakki ja soittimen täyteläinen keskialue tekevät tästä konserttiukulelesta erittäin vahvaäänisen. Tanglewood on suuri kielisoitinbrändi Englannista, joka teettää omat luomuksensa Kiinassa ja muissa Aasian maissa. Tanglewoodilla on peräti neljä ukulelemallistoa, joista Cove Creek on ehkä perinnetietoisin. Tanglewood Cove Creek TU-2ST on tämän katsauksen ainoa kiiltäväksi lakattu soitin. Ulkomuodoltaan perinteiseen sopraanoon on valittu kokopuinen kuusikansi, sekä bubingavaneriset sivut ja takakansi. TU-2ST:n työnjälki on erittäin korkealla tasolla ja soitin saapui testiin erinomaisissa säädöissä. Cove Creekin hyvin pyöreä ja keskipaksu kaulaprofiili tuntuu oikein mukavalta. Kokopuinen kuusikansi vaatii luonnollisesti hieman pidempää sisäänsoittoa, mutta jo tämän testirupeaman perusteella voin todeta, että Cove Creek TU-2ST:stä lähtee herkullisen vanhahtava sopraanoukulelen soundi. Tanglewood Cove Creek TU-10 on tämän katsauksen ainoa soitin kokopuisella kopalla ja kovalla laukulla. Vaikka TU-10 on tämän ryhmän selvästi kallein soitin, on sen hinta itse asiassa melko edullinen, sillä tämä konserttiukulele tarjoaa pro-luokan ominaisuuksia, kuten esimerkiksi yksiosaisen mahonkikaulan. Cove Creek TU-10 on perinteitä kunnioitava soitin avoimella viritinlavalla, vaahteraisella reunalistoituksella, helmiäisrosetilla, sekä kauniilla mattaviimeistelyllä. Kaulaprofiiliksi on valittu keskipaksu U.
Tanglewood Cove Creek TU-10:n ääni soi erottelevasti, lämpimästi ja vahvasti jo suoraan paketista tulleena. Kokopuiselta soittimelta on odotettavissa vielä lisää soundin kypsymistä ja kukkimista säännöllisen soittamisen ansiosta. Tämän katsauksen perusteella näyttää vahvasti siitä, että nyt olisi hyvä aika aloittaa ukulelen soittoharrastus. Jopa alle 100:n euron hintaluokassa on tarjolla laadukkaita soittimia, joilla soittaminen on hauskaa. Myös eri merkkejä, malleja ja kokovaihtoehtoja on nykyään Suomessakin laajalti saatavilla.